Today, we're excited to share another exclusive Sting: 25 Years webisode! 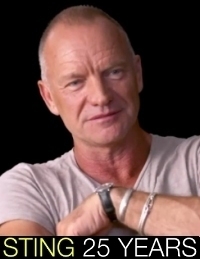 In this clip, Sting reflects on the years 2000 - 2008. The final webisode featured in the Sting.com '25 Days' countdown will premiere in the coming days. And later this week, we will be announcing details on the grand prize, so please continue to visit Sting.com at 11AM/EST daily! Also happening today, the Sting: 25 Years box set is available for sale! This consummate collection features 3CDs comprised of 45 newly remastered tracks spanning Sting's enduring solo career, the previously unreleased live concert DVD Rough, Raw & Unreleased plus a hardcover book containing rare photos, complete lyrics and personal commentary by Sting. Order a copy today! A joyful celebration with no anxiousness. You scee, by the reckoning of some cultures, and the estimations of others, Sting has already turned 60 and it most likely occurred last New Years Eve, or possibly Christmas Eve. Only Sting really knows. So, except for his drivers license, to some, it is already a done deal (just as some believe though they are living they have already died and future “death” has no grip on them.) This idea of a conceptual birthday hints at an additional reason, apart from what he has already expressed, regarding his fondness of winter, and why this season may deeply be embedded in his psyche. . . or . . . maybe not. ;) With an eye to the blue VIEWS, “the numbers lead a dance” 6075 . . . 6125 Happy belated (not berated) Birthday Sting! Gladlee C.E.B. B.C.E. Dear Sting, you are a great example to follow!!!! Big big thank you! Guys, do you agree with me?